This leak was discovered during a crawl space inspection. While running the upstairs shower we noted poor caulking around the shower door. Upon further inspection of the crawl space a leak was detected. Leaks in a crawlspace may go undetected for a long time, causing damage to the structure. Excessive moisture in a crawl space is a conducive condition for wood destroying organisms. 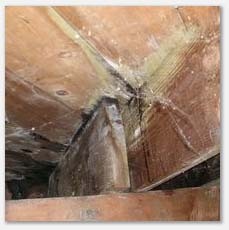 According to Washington State law, without a Structural Pest Inspectors License, you can not report on plumbing leaks and inadequate ventilation, restricted or non-functioning gutters, vegetation touching exterior siding, earth to wood contact, standing water in substructure, failed or missing caulk or grout at water splash areas, conducive debris in substructure. Our inspections always come with a complete wood destroying organism report at no additional charge. Do not accept a home inspection without a structural pest report! See our sample crawlspace report here.